The Atrium in 2 sentences: Life at The Atrium is a little more secretive than it’s welcoming lobby and large atrium entrance way might lead on. It has a desirable address, and with good reason; residents enjoy the privacy and the full service amenities that go along with spacious floor plans and luxury living The Atrium provides all while being just a few minutes away from the heart of Georgetown. 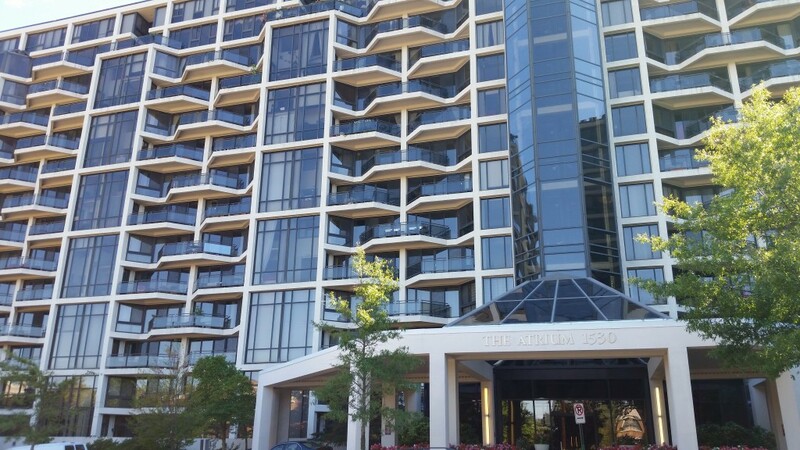 Built in 1986, The Atrium sits atop a hill in Rosslyn and is the largest condo community in the neighborhood. The building is made up of 350 units on 13 stories ranging from one bedrooms at 675 square feet all the way up to two-level 3 bedroom units that eclipse 2,000 square feet. The Atrium arguably has the best lobby in all of Arlington. You are greeted by lush greenery and a waterfall in the lobby. 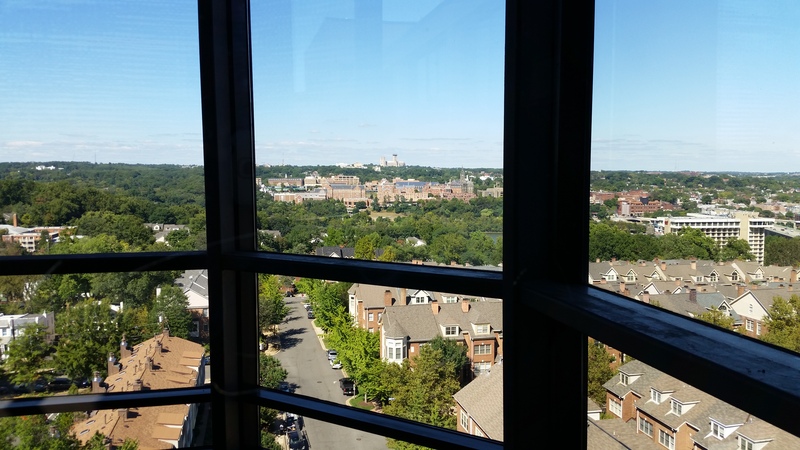 The waterfall sits right below the glass elevator that provides scenic views to the Northwest and Georgetown as it rises up to the Penthouse level. The front desk is staffed 24 hours a day. The amenities can also be found on the first level. These include the on-site drycleaners, fitness center, sauna, outdoor tennis courts, and outdoor pool. The residences at The Atrium Rosslyn can vary dramatically depending on upgrades made by previous owners. Many residents have made tremendous renovations to add a contemporary feel to their home. Many larger units are two levels, either having one bedroom on either floor, or having two bedrooms on the first floor and a third bedroom or office on the second level. Something unique about this is that the way they were constructed, there is not a complete privacy between the upstairs room and the room below it. There is a little gap between the window and floor. Many residents have renovated their units to complete the floor to separate these two rooms so there is privacy between the two. At The Atrium, the pieces are in place for a luxurious lifestyle. Many of the units that are currently rented out have not been renovated in quite some time, but they do not need to be; they still demand premium rents because it is a desirable community in a great location. It has an attractive address and has a certain ambiance about the building. It’s secretive. There are a lot of private sales. Address like 1530 Key Blvd, 1881 Nash, and 1200 Nash (among others) are seen as coveted and mysterious in the eyes of the surrounding community. Of course, this all depends on who you ask. The Atrium has two-story units, plenty of amenities, and other unique characteristics that contribute to it’s prestigious image and will continue to make it a desirable place to live for years to come.